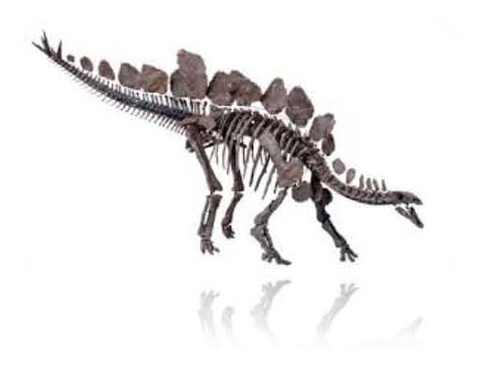 A few days ago we challenged the son of one of our customers to produce an article on the arrival of the new Stegosaurus exhibit at the Natural History Museum (London). Although, Stegosaurus is one of the most recognisable of all the dinosaurs, with its strange plates on the back and its spiked tail, referred to as a “thagomiser”, very little research on this genus of Late Jurassic dinosaur has been carried out in recent years. We suggested that young Milan should write a report on this Stegosaurus, his sister Alisha (aged 11), also joined in and produced a wonderful powerpoint slideshow containing lots of dinosaur facts and figures. Sophie the Stegosaurus was found in Wyoming, USA on its own. The weight of the animal is around 1 ton. Sophie the Stegosaurus would have eaten things like ferns and horsetails. The habitat where the animal may have lived could be rocky plain ground with lakes around it, this way they would have food and water when they most needed it. They may not have traveled very far from their homes to eat too. Sophie may have lived and walked though the forests, or even green canyon. The plain surroundings where the Stegosaurus may also have walked and lived in, would and could have been filled with rocky mini towers or marshlands (just like how it was shown on “Planet Dinosaur”). Stegosaurs may have lived in large number groups like a herd. This could be because groups made them feel safe. Also, when they are eating some of them could keep an eye out for predators. Stegosaurs lived as a herd and they grazed in small numbers too. Sophie the Stegosaurus had 19 plates that grew on its back and scientists believe that Sophie did have built-in defence, which was all along the back, in the shape of the large plates. The plates on the back may have been used as balance, and also they may have another propose which is very clever. When the animal feels like it is in danger or it needs to show that it’s the boss, the animal can change the colour of the plates by simply flushing its blood into the plates, which then changes colour to scare the predators off, this could be a small predator or even one as big as an Allosaurus. The Stegosaurus walked the earth around 150 million years ago – this was the Jurassic age. Looking at the animal more closely you can see that it has two large sharp spikes on either side of its tail. These spikes where used to slam and hurt predators that got to close to them. Time to time they also used these spikes to hurt each other. The powerpoint slide created by Alisha contains twelve, carefully crafted slides, Everything Dinosaur team members enjoyed viewing Alisha’s presentation. The size of huge Sauropods. To conclude her excellent powerpoint presentation, Alisha compiled a short quiz (fortunately she did include the answers). Clearly with Milan’s dinosaur knowledge and Alisha’s presentation skills, if the media team at the Natural History Museum ever need any help they will know who to turn to. 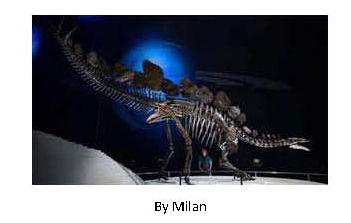 Concluding his article on “Sophie” the Stegosaurus, Milan provided Everything Dinosaur with a list of ten things that we ought to know about these armoured dinosaurs. 1 . Stegosaurus is the most famous dinosaur from the group known as stegosaurids. They are plant-eaters of the Jurassic age , some scientists think of the tail and if the Stegosaurus has the defence against predators. 2. There have 19 plates found along the back of Stegosaurus and 4 spikes on its tail. 3. At 560 centimetres long and 290 centimetres tall, similar in size to a 4×4 vehicle, the skeleton has over 300 bones. It was found virtually complete in the USA 11 years ago, with only the left arm and base of the tail missing. 4. The plates and spiky tail are used to scare other dinosaurs away. 5. The Stegosaurus`s use plates to reflect colour to scare predators and control the tail to help the spiky tail to hit a target. 6. Stegosaurus has 300 bones to show museums like the Natural History Museum. Visitors will see the Stegosaurus (Sophie) on display at the museum. 7. Some palaeontologists believe that the action of the tail and plates that Sophie had were used in defence, like a prehistoric hammer. 8. Stegosaurus has a beaky mouth, perfect to eat soft plants. 9. Sophie was not fully grown when she died. There were many types of different sized Stegosaurus around America, “Sophie” was a Late Jurassic herbivore. There were many armoured herbivores in the Early Cretaceous too. 10. Stegosaurus means “roofed lizard”, it was a vegetarian (herbivore), other dinosaurs were carnivores. Our thanks to Milan, Alisha and dad Neil for letting us post up the information on dinosaurs that they compiled for us after we gave them one of our “pinkie palaeontologist challenges”. Article written by Milan, with powerpoint presentation by Alisha.